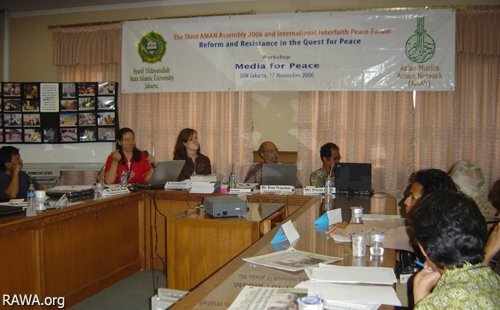 The Moro Times was invited to the 2006 Assembly of the Association of Muslim Action Network and International Interfaith Peace Forum on November 15 to 18 at the Uni­versiti Islami Negara in Jakarta, Indonesia. I discussed the situation of the media and conflict in the Philippines. RAWA representative delivers a lecture on "Media for peace and the challenge of Islamic extremism: Learning from RAWA experience" in the 3rd Assembly of the Asian Muslim Action Network (AMAN) in Jakarta. Two women who presented country cases captured my attention with their assessment of how women are victimized in conflict areas, even as “peace” comes. Made me fearful about the future. Another Muslim feminist, Marian Rawi (not her real name) of the Revolutionary Association of the Women in Afghanistan (RAWA) broke our hearts with her first hand account of the pain and suffering of Afghan women, even after the Taliban were driven out by the American forces. Do you know that children cannot fly a kite in Afghanistan? The Taliban ulama, in 1994, banned kite flying (gives a new twist to the phrase “go fly a kite!”) Such a shame since strong winds in the mountains of Afghanistan makes the condition perfect for flying kites. Marian narrated that 35 years ago, her grandmother and mother never used a burkah to hide their faces. Women were educated and went to work. To tell the world about what was happening to Afghanistan during the time of the Taliban, RAWA would videotape and photograph atrocities, giving their photos and tapes to whoever would smuggle the precious documents out of the country. After the Taliban regime ended, Marian and her group were optimistic that they would have a better life. Their hopes were dashed. The Taliban's oppressive regime has been replaced by equally oppressive warlords. The extremist ulama remained powerful. RAWA has since learned to rely on the Internet to publish news about Afghanistan. She said Japanese students helped them, online, to develop their website into a news source. Marian said, “Fundamentalists are so ‘concerned' with the minutiae of women's attire, how they should behave, caning them in public, humiliating them, nipping in the bud any move to improve their life, education, and health using religion as a pretext, twisting Islam out of context, but the same people turn a blind eye on the opium.” Afghanistan, post-Taliban, has become the world's major supplier of opium.